Tribeca is a neighborhood that gracefully refuses to make a big deal out of the big deals in film, music, fashion and the arts who thrive here. Your key opens onto a spacious, mid-century residence fit for a modern-day Charles and Ray. Smyth is excited to showcase our new lobby, Evening Bar & restaurant. Little Park, a seasonal restaurant by James Beard award-winning chef, Andrew Carmellini, has officially opened! 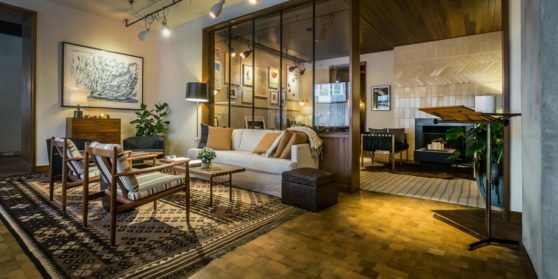 Inspired by the rich history and vibrant culture of Tribeca, Smyth re-launches as a sanctuary of comfort and familiarity, with highly curated, residential-style gathering spaces. Little Park is also available for 24/7 room service. Smyth offers new amenities from our complimentary town car service in the 10 block radius, twice daily housekeeping service, complimentary bottled water at turn-down and complimentary wi-fi. Tribeca is a place to relax – Smyth is its living room. With an upper-case style infused with lower-case intimacy, Tribeca’s history and culture are all part of the conversation at Smyth. And with a warm redesign by Gachot Studios, it’s a relentlessly relaxed vibe – precisely for those whose pace rarely relents. Award-winning restaurateurs Andrew Carmellini, Luke Ostrom and Josh Pickard have planted their roots in New York’s downtown restaurant scene. Now they can add Smyth’s Little Park and Evening Bar to their string of successes.